IF your currency is not displayed, apply US Dollar for Worldwide orders. PayPal allows you to convert the order to your preferred payment currency at checkout. manufacturing and find the lowest price for you! How it works... A quick intro! After I order- What's next? I have a designer... what do I do? What is a manufacturing template? Request Quotes, Send files, Give instructions... it's easy! If you're an agency or customer buying for the first time wholesale... Let our professional graphic designers find the lowest price for you. They can quote, setup, design, compose and upload ready for your approval. Tell us what you need. Give us instructions and attach and send any files/logos you may have. Graphic Designers inspect your instructions, find the lowest price products and contact you. When you're ready to print, You choose the best solution, It's online, fast and ready to approve. Request a Quote, Talk with an expert sign designer and project planner, graphic designer or your account manager. Add your name and details & Attach any files/logos/images you may have. You can give instructions and tell the designers how you want your design to look. TIP: Give instructions for each element you send. A graphic designer will summarize your creative requests, quote if any design work is needed and contact you. A graphic designer will upload the banner print ready file, generate an Instant Preview and give you access to your 'MyPage' so you can approve and proceed. Also see: Setup Charges - Free or Paid? "Huge thank you for all your amazing assistance! Fantastic service, It is so good to do business with such an efficient online company"
"I am very impressed by their work! They went above and beyond all of our expectations with design, usability and branding, I will recommend them to everyone I know!" "Travis is a star! What he did in one hour would normally take me all day. Their art service is exceptional. I recommend you use it." " Perfect! Thanks so much for your wonderful design - it was incredibly successful! We were also very happy with the express delivery! You can't beat their quality and attention to detail! " "We are very happy with our event banners! They all look fabulous at festivals and are really eye-catching! The quality really stands out 5/5!" "Melissa & Sabrina, are the most helpful designers I've ever hired. You can't beat their quality and attention to detail!" "Their price is half of other retailers!" 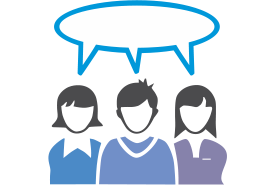 "Laura put it together with speed, professionalizm and within 1 day. I'm glad I found you guys! I am happy to recommend her talents to anyone." The wonderful customer service made the whole online process incredibly pleasant. I'll be back. Thanks again!" "Your service from the initial order to design then delivery has been flawless." "Having the ability to concept an idea to a layout is brilliant. They understand the customers needs." "Real people you can talk to..."
"Outdoor advertising is now our main promo contact with local people. It's been working out great for us. Thanks." "I find it easier to attach a few logos, give them a few instuctions and let them do it. They are very professional and fast." "We found people engaged in the roadside banner more than local press. I'm glad we found Signs Banners Online." "This is best service I know. I rely upon the artists because they are very good. You can use them too." • Fold Over Bleed (MOS) for custom size, pole pocket and display products. SBO have a team of qualified sign makers & designers ready to help. The price sounds good. Always a pleasure doing business with you. It's great to have one vendor that you can trust. "We've found they have superbly competitive prices, exceptional product durability and have a feature rich service platform." "We've used them dozens of times. It's faster, easier and cheaper"
"Their designers are very intuitive and know how to make a banner sign work. I recommend them." "Professional and Fast. They get results and save you money." "My fabric media wall is amazing. Everyone takes self posing photos with my brand backer. Thank you. "Everything you need to make customers happy." "The reaction from our clients has been very positive and they engage with the stand the moment they see it." " Part1. WOW! I can't praise you guys nearly enough. The speed that I got my banners was so fast. The support team has been really great. " " Part2. I love my banners and the online ordering was simple for me... I was so surprised that the carrier was at my door within days... great service guys. " " Following the factory and carrier is the best. I know my orders are on their way. " " They support wholesalers and resellers better. Their prices are cheaper! " 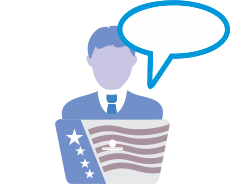 " Awesome... looked fantastic... As a reseller, I am all for your site. " 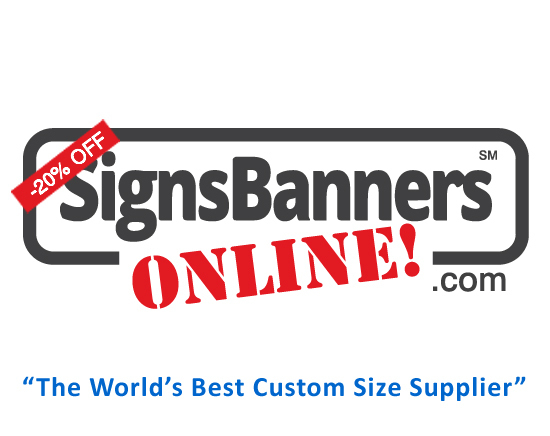 "signsbannersonline.com are the only ones to use"
" Fresh, dynamic and knowledgeable I recommend Signs Banners Online." Public Relations Firm. Market St.
" I recommend them to every wholesale reseller out there. They are fantastic. " " You can put this on your website, I am very happy for the really great job." Use our team of qualified graphic designers to get what you need. Attach and send your logos, instructions and details and we will do it all for you. Free or Paid? Quickly choose setup options and features here. A great chance to see what can be achieved is by visiting A few weeks at Signs Banners Online in and around the factory videos. We are very proud of this result and look forward to showing you why PP regard us as a store to build your brand with. The state-of-the-art Large Format printers are capable of producing everything from posters, banners and trade show graphics all the way to billboards, fence wrap and screens. With the addition of the 125" textile printer, you now have access to the largest and fastest dye-sublimation printers and heat presses available... and it's all factory direct to you. Combined with a capacity for over 100000 sq ft of Large Format Print per day it's now ready for you to upload. Super Wide offers crazy cheap prices for you. We are dedicated to supplying you with factory you prices, access to the latest grand and wide format printing equipment and resources. Factory: Offering wholesale direct to you, customers can upload a special manufacturing template available free from Signs Banners Online. If you are unsure how to order wholesale, please visit our free or paid setup pages, where we can assist you and we do it all for you. Access Techsheets, material used and other product data. Equipment List SBO currently printing via 3.2, 3.5 1640, 5.0 and other. Technologies include: Direct to Garment, EcoSol Direct to PVC, UV, Dye-Sub Transfer and Latex. Start with a manufacturing template available free from Signs Banners Online. We are creating a new April FAQ's section here to help designers set up and manage their orders. It's full of wow! Having issues? We've got all the Troubleshooting topics covered. You have a project but dont know where to start, lets start talking one on one with a graphic designer who can guide you through the important elements you'll need, our factory support team are there to help you at anytime with helpful advice. Do you have ideas but dont know how to implement them to get a final product? Use our Let Us Design page and attach all your inspirational images, logos, text etc and one of SBO's experienced Graphic Designers will compose your creative elements and show you the preview of the order. This site is by designers... for designers... and offers you direct access to the factory equipment, print queues, templating, order tracking, discounts and more. To order: All you need to do is correctly overlay your client designs onto a manfacturing template, flatten and upload. Now used over 12,787 times The Easy Template Maker is an amazing free tool. Simply input your client requests, and generate the perfect manufacturing template free! Then, you'll be able to overlay your creative and send to a printing company. It's the perfect way to order quality work online. To order, template or upload... you do not need an account. Your shipping label becomes your order tracker via a special MyPage link. All Custom Orders require Material Over Size Specifications matched to the order. All Hemmed, AND, Pole Pocket, AND, Custom SIZE Orders require 1:1 file output via these specifications. All Knife Edge Only Orders require 1:1 file output via these specifications. All Economy Pre-Set Size Orders require these default manufacturing templates and can not be altered. 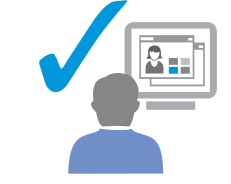 The new Learning Center is a way for you to discover the latest methods for producing signage, displays and other graphic topics. It's brilliant and worth looking at. Optimizing Photoshop Flatten Image WHY??? The brilliance of SBO's online trade printing system it that it allows agencies to customize all their creative, then upload immediately into the printing queue. The material substrates are world class and made for durability. When you have special request, preset criteria or need other custom features, all you need to do is ask. We are dedicated to wholesale, and look forward to completing projects with you. Choose Who will Setup the Printing? What you'll get is great people that are expert making your custom products direct from the factory. At any time you can use our special factory manufacturing templates customized to suit you - Free! Always the lowest prices Join thousands of local customers buying banners & signs the easy way! Choose Who Will Setup The Order? We do it for you. Can I pre-flight my files? YES. You can pre-flight your manufacturing templates without payment. Continue through the order & upload stages as normal, and SBO will pre-flight your order automatically advising of any elements that need attention. As your order progresses, the uploader generates an Instant Preview for you to check. Signs Banners Online is a wholesale printing service for the graphic design, advertising agency and wholesale buyer. Offering many online features - repeat agencies or customers buying for the first time wholesale can order without login or account via our free manufacturing templates custom suited to their order. Once you identify the print material for your banner or display, you'll be able to upload directly into the printing queue. It's faster, easier and cheaper! Created by a team of graphic designers specializing in making huge banner signs for customers. An idea developed to build an online website where graphic designers and wholesalers from around the world could effectively combine orders to lower prices. They upload directly into a factory printing machine and watch as their orders move around the factory and to their door. Direct factory production offers designers a huge -20% price discount, and as time goes on and more people use S B O, todays discount is expected to grow as bulk savings are applied. And... from the comfort of your desk, you can now ship out to over 150 Countries. Products such as Vinyl Banner have achieved huge discounts that now offer our graphic designer friends, agents and resellers discounts. Factory direct prices, bulk material savings and more are all part of our 'Lowest Price' policy we pass onto you. Order wholesale from the #1 custom banner sign service. Watch as your order moves around the factory and to your door, release payment when your goods arrive. Upload design files into the printing queue. Instant Preview, Approve and manage online. Orders ship out within 16 hrs. "It's faster, easier and cheaper!" Apr -- Custom Work -- Did you know 90% of our work is custom size to your needs? It's easy... Ask us how. Are you sure you want to close this chat? Chat will not be saved.